Swift's X-Ray Telescope captured an apparent expanding halo around the flaring neutron star SGR J1550-5418. The halo formed as X-rays from the brightest flares scattered off of intervening dust clouds. Astronomersusing NASA's Swift satellite and Fermi Gamma-ray Space Telescope are seeingsome frequent high-energy fireworks from a stellar remnant 30,000 light-yearsaway. The celestialblasts arise from a rare type of neutronstar known as a soft-gamma-rayrepeater. 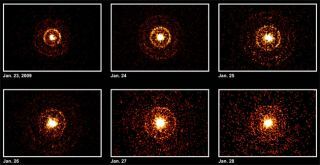 Such objects unpredictably send out a series of X-ray andgamma-ray flares. "Attimes, this remarkable object has erupted with more than a hundred flares in aslittle as 20 minutes," said Loredana Vetere, who is coordinating the Swiftobservations at Pennsylvania State University. "The most intenseflares emitted more total energy than the sun does in 20 years." The object,which has long been known as an X-ray source, lies in the southernconstellation Norma. During the past two years, astronomers have identifiedpulsing radio and X-ray signals from it. The objectbegan a series of modest eruptions on Oct. 3, 2008, then settled down. Itroared back to life on Jan. 22 with an intense episode. Because ofthe recent outbursts, astronomers will classify the object as a soft-gamma-rayrepeater ? only the sixth known. In 2004, a giant flare from anothersoft-gamma-ray repeater was so intense it measurably affected Earth's upperatmosphere from 50,000 light-years away. Scientiststhink the source is a spinning neutron star, which is the superdense,city-sized remains of an exploded star. Although only about 12 miles across, aneutron star contains more mass than the sun. The object has been cataloged asSGR J1550-5418. Whileneutron stars typically possess intense magnetic fields, a subgroup displaysfields 1,000 times stronger. These so-called magnetarshave the strongest magnetic fields of any known object in the universe. SGRJ1550-5418, which rotates once every 2.07 seconds, holds the record for thefastest-spinning magnetar. Astronomers think magnetars power their flares bytapping into the tremendous energy of their magnetic fields. "Theability of Fermi's gamma-ray burst monitor to resolve the fine structure withinthese events will help us better understand how magnetars unleash theirenergy," said Chryssa Kouveliotou, an astrophysicist at NASA's MarshallSpace Flight Center in Huntsville, Ala. The object has triggered the instrumentmore than 95 times since Jan. 22. Using datafrom Swift's X-ray telescope, Jules Halpern at Columbia University captured thefirst "light echoes" ever seen from a soft-gamma-ray repeater. Imagesacquired when the latest flaring episode began show what appear to be expandinghalos around the source. Multiple rings form as X-rays interact with dustclouds at different distances, with closer clouds producing larger rings. Boththe rings and their apparent expansion are an illusion caused by the finitespeed of light and the longer path the scattered light must travel. "X-raysfrom the brightest bursts scatter off of dust clouds between us and thestar," Halpern said. "As a result, we don't really know the distanceto this object as well as we would like. These images will help us make a moreprecise measurement and also determine the distance to the dust clouds."